As a kid Halloween was always one of my favorite holidays and I love to watch my kids get just as excited as I do. We use to play a lot of games on Halloween; here I just put 9 Halloween game ideas for kids together. They will go with it, don’t worry. First up, a “brain” game. There’s a fun game on store shelves where you pick through a rubber “brain” to figure out what’s in it. You can create this easily yourself. Make some and fill it with a variety of items, like gummy worms and other gummy candies, some small candy and trinkets and other items. Tell the children to root around in the bowl of jello (call it a “brain” if this will get the kids more interested) to figure out what’s in it. It’s goopy and messy and kids love it. Best yet, color the jello black so it’s too dark to see what’s inside and it looks more like goopy brain matter (the way kids see it, anyway). Kids love the spaghetti game. Be sure they are wearing a smock over their clothes or are wearing play clothes before playing these kind of games for kids. Make a big bowl of spaghetti and fill it with all kinds of items, like plastic bugs, gummy worms and other items that might feel a bit strange. Make the children feel around in the bowl of spaghetti and identify the items they feel. Once they are done and cleaned up, have them list as many items as they can remember. Whoever gets the most items listed (and right) gets a prize. Spaghetti, anyone? What´s in the box guessing game. Just take a cardboard box and paint it black, both the inside and outside. Carve a small hole in the top, really just large enough for the children to get their hands into, and fill the box with a variety of items. They can be related to Halloween (like a small pumpkin) or not (wrapped Tootsie rolls or a tiny toy Hummer car). Have the children guess what’s inside the box and award the box itself to the child who guesses the most number of items correctly. To make this goopy and silly, be sure to include some items that might feel like body parts or brain matter. Halloween is probably one of the most popular times to paint faces, especially the whole face painting. The choices are wide, including such as: Vampires, clowns, witches, Winnie the Pooh, ghosts, pirates, genies, dinosaurs, bumble bees and bunnies. Many parents just can’t resist painting the ever popular Winnie the Pooh. A ghost is low-cost and simple for those who are strapped for cash at Halloween, needing only white paint (maybe a little black circle around each eye if you want a better effect to emphasize the holes. Many parents just can’t afford the costumes or simply don’t want to invest in something that will be outgrown before the next year’s event. This makes face painting a great choice. You can paint the right face and wear one of your own outfits to make it work! Kids love creating silly fictional stories, often with absurd plot-lines. Halloween is the optimum time to let them run wild with their imaginations. Have them spend a bit of time writing out the scariest story they can think of. Some children might need some direction not to make it ridiculously grotesque, so use caution with these children in your clarification of this assignment. Once the stories are written, have the children hand them in and then have a guest reader for each one of them. Each child will come to the front of the class and read the story with as much dramatization as they can muster. Once the story is read, everyone has to guess who wrote the story. The writer should play along, otherwise everyone will know it was their story! The winner is the child who wrote a story so intriguing and unusual that nobody knew it was his or hers! Last month LEGO released the new set. 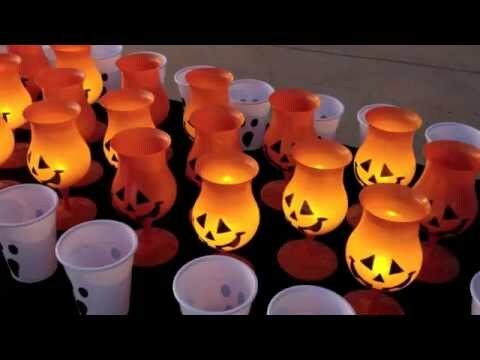 The kids can role-play a spooky Halloween scene, and build a haunted house entrance. It includes some “scary” items like a tombstone, spider, sickly green plants, dead tree and a cute skeleton. I just ordered it as a toy gift for my little niece and nephew (7 and 9 year old). Playing “musical chairs” is among the easy fun Halloween games for kids. This version includes playing Halloween music (think “Monster Mash” or “Thriller” by Michael Jackson) and asking the kids to act as spooky and scary as they can while they race around the chairs. You can up the rules depending on the ages of the children. For example, for toddlers you can tell them to just walk around the chairs until the music stops. As they get older, you can add challenging elements, such as make scary faces as you walk around the chairs, do the monster mash (whatever that means to the individual kid) and other things like that. You’re sure to get some creative responses. Kids of all ages enjoy making mummies out of themselves and their friends. Here’s how this works. You bring in toilet paper, lots and lots of toilet paper. Divide the kids into teams of 2. When you begin timing the kids, they must wrap their friend up in the toilet paper, mummy style. The first team who is all wrapped wins. The child who’s wrapped up like a mummy can then break out of the toilet paper wrap with a scary “roar” and the game begins again so the other child can also be wrapped. Be sure to play some spooky Halloween music while this game is being played to add to the atmosphere. Hope you enjoyed my Halloween game ideas for kids. P.S. Of course it´s not all about the spooky season here, join me on my next article about ball bouncing games for the whole family.